This white oak chest was commissioned as a wedding gift, from the groom to the bride. Both were active in a historical reenactment society, and the chest was to hold their finest garments at events. 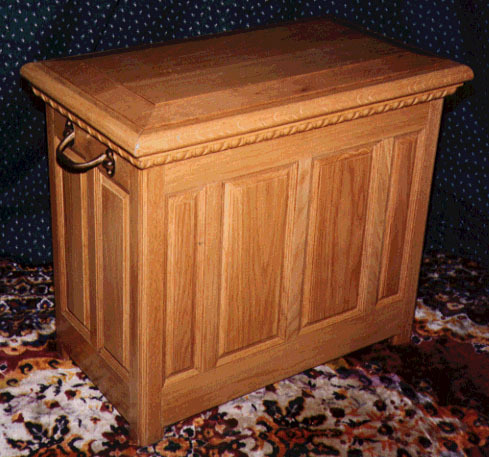 The chest was to be sturdy enough that a large person could casually sit or stand on the lid without fear of any part of the chest breaking. Any clothing stored in the chest should stay completely dry, even if it got left out in a pouring rain. The appearance and decorations were to be suitable for a chest circa 1500 to 1600 AD. Yet the chest should be light enough in weight that it could easily be carried while fully loaded with clothing. I designed their chest as a true frame and panel design. The hinges and handles were solid cast brass. The lid is over one inch thick, and is set into the top frame with a double interlocking groove, to seal out moisture. The rim of the chest and of the lid frame are milled with an interlocking seal to keep water and dust out. 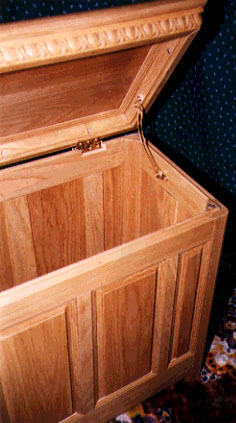 With the exception of the carved egg and dart trim around the rim of the chest lid, all the millwork and construction was done in my shop.There were 50 seperate pieces of wood that were individually milled and assembled to make the chest (see below). When fully assembled, the chest was light in weight, and so tightly fitted that tapping on the sides of the chest sounded like tapping on a drum.